The church website provides a very detailed description of the Great Western Rose Stained Glass Window by Charles Connick. I copied material from the website describing the individual panels. The first part starts at the left circle in the middle of the photo and goes from left to right. The Glorious Mysteries start on the left: 1) The Resurrection – Jesus conquers death by rising to a new and more glorious life. 2) The Ascension – Jesus ascends to the Father. 3) The Descent of the Holy Spirit – The Holy Spirit comes down upon the disciples and Mary at Pentecost. 4) The Assumption of Mary – The Mother of God is taken up, body and soul, to heaven. 5) The Coronation of Mary – Mary is given a share in Christ’s sovereignty over all things. In the middle tier are the Sorrowful Mysteries, from left to right: 6) The Agony in the Garden – Jesus sweats blood as he prepares to accept his death on the cross. 7) The Scourging of Jesus at the Pillar – Jesus’ body is whipped and beaten. 8) The Crowning with Thorns – Jesus is cruelly mocked and humiliated by soldiers who crown him with thorns and bow before him. 9) The Carrying of the Cross – Jesus hauls the wood on which he will die to Calvary. 10) The Crucifixion – Jesus is nailed to the cross and dies for our sins. 11) The Annunciation – Mary humbly accepts the call delivered by the angel to be the mother of the Savior. 12) The Visitation – Mary is recognized as mother of the Savior by her cousin Elizabeth. 13) The Nativity – Jesus is born. 14) The Presentation of the Lord – Jesus is presented in the Temple and prophecies are made about the path of his life. 15) The Finding of Jesus in the Temple – The wisdom and knowledge of Jesus are manifested as he teaches the Temple elders. Charles Connick (1875-1945) produced the spectacular stained glass windows in the church. Connick was a prominent artist best known for his work in stained glass in the Gothic Revival style. He was born in Crawford Country, Pennsylvania and developed an interest in drawing at an early age. He left high school when his father became disabled to become an illustrator on the staff of the Pittsburgh Press. At the age of 19, he learned the art of stained glass as an apprentice in the shop of Rudy Brothers in Pittsburgh, where he stayed through 1899. He worked for a number of stained glass companies in Pittsburgh and New York. 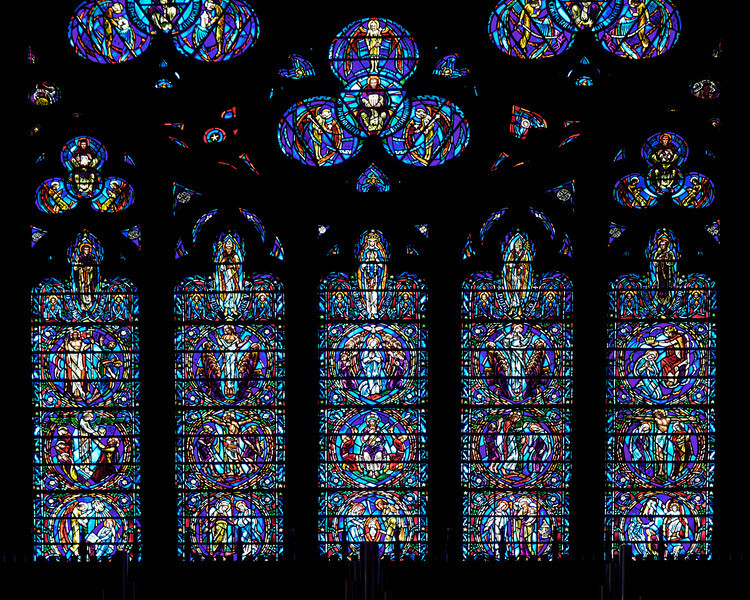 He went to England and France to study ancient and modern stained glass, including those in the Chartres Cathedral. His first major work was First Baptist Church in Pittsburgh in 1912. The Charles J. Connick Stained Glass Foundation was formed after the studio closed in 1986. According to the foundation website “The mission of the Charles J. Connick Stained Glass Foundation, Ltd. is to promote the true understanding of the glorious medium of color and light and to preserve and perpetuate the Connick tradition of stained glass.” Here is an interesting video from the Massachusetts Institute of Technology on Connick. In December 2008, the foundation donated materials to the MIT’s Rotch Library of Architecture and Planning to form the Charles J. Connick Stained Glass Foundation Collection.